In a discharging ear both topical and systemic therapy is employed to control the infection. , Choice of systemic therapy depends on the organism isolated in the culture. Our study is aimed at finding the local pattern of microbes and their antimicrobial susceptibility pattern in cases of COM to provide a guideline for empirical antibiotic therapy. This study is a retrospective observational study conducted in Tertiary Care Center in India. 106 patients of COM who presented to the ear, nose, and throat department from April 2011 to April 2012 were studied. Details of the history and examination findings were verified from the records. All patients who had active ear discharge for more than 3 months duration were included in the study. Patients, who had otomycosis or malignancy in the ear, at the time of presentation were excluded. Single use commercially available cotton swabs were used to collect pus. Utmost care was taken to avoid surface contamination and the swabs were sent to the microbiology laboratory for further processing. The pus swabs were cultured on the blood, chocolate and MacConkey's agar and incubated at 37°C for 24-48 h. The blood and chocolate agar plates were incubated in a CO2 incubator. All organisms isolated were identified according to the standard microbiological methods. Antimicrobial susceptibility tests were performed using Kirby-Bauer disc diffusion method. The standard antimicrobial discs used for Staphylococcus aureus were Oxacillin 1 μg and Erythromycin 15 μg. The standard antimicrobial discs used for Pseudomonas aeruginosa were Gentamicin 10 μg, Amikacin 30 μg, Ciprofloxacin 5 μg, Ceftazidime 30 μg, Piperacillin/Tazobactam 100/10, 110 μg, Levofloxacin 5 μg, and Netilmicin 30 μg. There were a total of 106 patients included in the study. Age ranged from 8 years to 83 years. There was a slight male preponderance, 62:44. Single organism was isolated in 72 patients (67.92%), while 34 (32.07%) showed mixed cultures. The most common organism isolated was P. aeruginosa 48 (30.96%) followed by S. aureus 46 (29.67%). Coliforms were isolated in 22 patients (14.2%). Methicillin resistant S. aureus isolation rates were 8 in numbers. Data segregation was carried out between south and north. Out of 48 cases with P. aeruginosa infection, 28 (18.06%) were from the south of India and 20 (12.9%) from north. For S. aureus data from the south and north of India was 23 (14.83%) each. For Coliforms 13 (8.34%) were from south and 9 (5.81%) from north. Non-fermenting gram negative bacilli (NFGNB) 12 (9.67%) were from south and 5 (3.22%) from north. In total, P. aeruginosa [Table 1] were susceptible to Piperacillin in 94% (95% south and 92.36% north) of cases, Ceftazidime in 83.3% (82% in south and 85% north) and Amikacin in 81.2% (75% south and 90% north), Levofloxacin in 51% (40% in the south and 69% in north) Netilmicin and Tobramycin in 63.3% each (50% in south and 84.6% in north) Aztreonam 62.5% (70% in south and 83.5% in north), Ciprofloxacin and Gentamicin 62.5% each (50% in south and 66% in north). 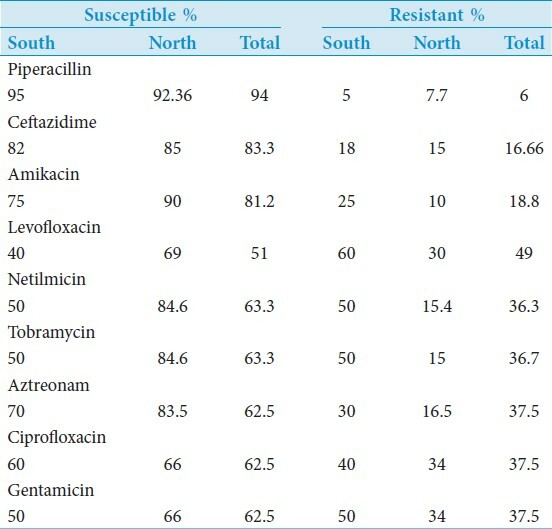 Drug susceptibility pattern for S. aureus [Table 2] showed that 80% of the total isolates were susceptible to Oxacillin, of which south was 82.6% and north was 78%, whereas only 43% of isolates were susceptible to Erythromycin of which 56.5% in south and 30.4% in north. Out of 17 NFGNB [Table 3]a isolates, 15 specimens susceptibility were carried out and for the rest of two specimens special sensitivity were asked. In 15 specimens total 93.34% of NFGNB were susceptible for the Piperacillin (south 90%, north 100%), 80% for Ceftazidime (south 90%, north 60), and 66.67% each for Amikacin, Levofloxacin, Netilmicin and Tobramycin (south 70% north 60%). 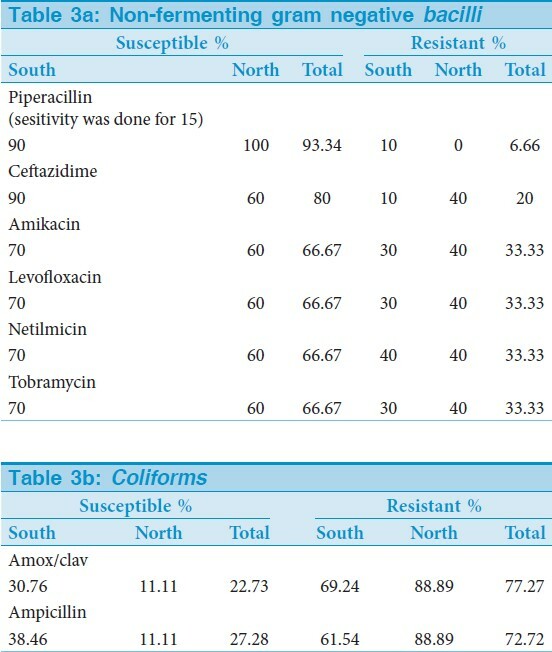 For Coliforms, [Table 3]b only 22.74% samples were susceptible for Amox/clav (30.76% in south and 11.11% in the north) and 27.28% samples were susceptible for Ampicillin (38.46% in south and 11.11% in north). Otologists, pediatricians, and general practitioners commonly see COM and its complications. Early bacteriological diagnosis of all cases will assure accurate and appropriate effective therapy. For selection and prescription of antibiotics, antibiotic efficacy, bacterial resistance, safety, risk of toxicity and the cost is to be considered. Biofilm formation is emerging as a factor for persistence of the infection. Biofilms consist of communities or groups of microorganisms that attach to the surfaces of animate objects such as heart valves, bones or tissues or to inanimate objects such as artificial heart valves and prosthetic implants. Knowledge of the local microbial scenario and the antibiotic susceptibility pattern is essential to formulate a protocol for empirical antibiotic therapy. Antimicrobial susceptibility of P. aeruginosa in our study revealed that 94% isolates were susceptible to Piperacillin while 83% of isolates were susceptible to Ceftazidime, 81% susceptible to Amikacin and 63% to Ciprofloxacin, Tobramycin, Gentamicin and Aztreonam. Globally, a change has been noticed in the susceptibility of P. aeruginosa towards Quinolones in the last few decades. One study carried out in 1996 in Turkey revealed only six% of P. aeruginosa isolates to be resistant to Ciprofloxacin,  where as in South Korea in a study carried out in 2004 Ciprofloxacin resistance was noted in 100% of the isolates. In contrast our study has shown 62.5% of isolates to be susceptible to Ciprofloxacin. A study done in Singapore,  has shown significantly higher percentage of P. aeruginosa isolates susceptible to Gentamicin when compared to ours. With these type of results in the present era the otorhinolaryngologist has to depend on the Ciprofloxacin oral preparations to treat P. aeruginosa, though the organism is retaining its susceptibility to higher antibiotics that are available in injectable form and can be prescribed in complicated forms of P. aeruginosa infection. While for S. aureus 80% of the isolates were susceptible to Oxacillin and only 43% were susceptible to Erythromycin. Susceptibility patterns of NFGNB and Coliforms were not encouraging with respect to the conventional antibiotics and needed susceptibility with a second line of antibiotics carried out. However, since this study involved small numbers of isolates special susceptibility tests were not carried out. The declining susceptibility trend may be due to a number of factors including injudicious use and inappropriate dosage and easy access to antimicrobials as well as the organism developing resistance to Quinolones. P. aeruginosa was the most common isolate followed by S. aureus. Coliforms bacterial isolates were more compared to other studies and needs further study to find out the cause. Susceptibility of P. aeruginosa isolates showed good susceptibility to Piperacillin, Ceftazidime, Amikacin and 62% susceptibility to Ciprofloxacin. S. aureus were susceptible to Oxacillin in 80% of isolates. Looking at our results, there are differences in organism isolated from a different region and they have different susceptibility pattern as well. This suggests the growing misuse of the antibiotics along with other factors is leading to change in the susceptibility pattern. 1. Osma U, Cureoglu S, Hosoglu S. The complications of chronic otitis media: Report of 93 cases. J Laryngol Otol 2000;114:97-100. 2. Trimis G, Mostrou G, Lourida A, Prodromou F, Syriopoulou V, Theodoridou M. Petrositis and cerebellar abscess complicating chronic otitis media. J Paediatr Child Health 2003;39:635-6. 3. Monasta L, Ronfani L, Marchetti F, Montico M, Vecchi Brumatti L, Bavcar A, et al. Burden of disease caused by otitis media: Systematic review and global estimates. PLoS One 2012;7:e36226. 4. Rupa V, Jacob A, Joseph A. Chronic suppurative otitis media: Prevalence and practices among rural South Indian children. Int J Pediatr Otorhinolaryngol 1999;48:217-21. 5. Shaheen MM, Raquib A, Ahmad SM. Prevalence and associated socio-demographic factors of chronic suppurative otitis media among rural primary school children of Bangladesh. Int J Pediatr Otorhinolaryngol 2012;76:1201-4. 6. Brook I. Microbiology and management of chronic suppurative otitis media in children. J Trop Pediatr 2003;49:196-9. 7. Brook I. Role of anaerobic bacteria in chronic otitis media and cholesteatoma. Int J Pediatr Otorhinolaryngol 1995;31:153-7. 8. Miró N. Controlled multicenter study on chronic suppurative otitis media treated with topical applications of ciprofloxacin 0.2% solution in single-dose containers or combination of polymyxin B, neomycin, and hydrocortisone suspension. Otolaryngol Head Neck Surg 2000;123:617-23. 9. Suzuki K, Nishimura T, Baba S, Yanagita N, Ishigami H. Topical ofloxacin for chronic suppurative otitis media and acute exacerbation of chronic otitis media: Optimum duration of treatment. Otol Neurotol 2003;24:447-52. 10. Kenna MA, Rosane BA, Bluestone CD. Medical management of chronic suppurative otitis media without cholesteatoma in children: Update 1992. Am J Otol 1993;14:469-73. 11. Ricciardiello F, Cavaliere M, Mesolella M, Iengo M. Notes on the microbiology of cholesteatoma: Clinical findings and treatment. Acta Otorhinolaryngol Ital 2009;29:197-202. 12. Poorey VK, Lyer A. Study of bacterial flora in csom and its clinical significance. Indian J Otolaryngol Head Neck Surg 2002;54:91-5. 13. Hivemath SL, Kanta RC, Yeshwanthrao M, Vasantha kumar CM. Aearobic bacterial isolates of CSOM and their antibiotic sensitivity pattern. Indian Pract 2001;54:486-89. 14. van Hasselt P, van Kregten E. Treatment of chronic suppurative otitis media with ofloxacin in hydroxypropyl methylcellulose ear drops: A clinical/bacteriological study in a rural area of Malawi. Int J Pediatr Otorhinolaryngol 2002;63:49-56. 15. Altuntas A, Aslan A, Eren N, Unal A, Nalca Y. Susceptibility of microorganisms isolated from chronic suppurative otitis media to ciprofloxacin. Eur Arch Otorhinolaryngol 1996;253:364-6. 16. Jang CH, Park SY. Emergence of ciprofloxacin-resistant pseudomonas in chronic suppurative otitis media. Clin Otolaryngol Allied Sci 2004;29:321-3. 17. Loy AH, Tan AL, Lu PK. Microbiology of chronic suppurative otitis media in Singapore. Singapore Med J 2002;43:296-9.